Push the door on "Janie's"! Our team welcomes you.At the entrance of the bar, the scaling bench offers you oysters, lobsters, crabs, and seasonal seafood. In this Brasserie atmosphere, let yourself be tempted by the fisherman's plate or the friends' board, delicious accompanied by a small glass of chablis.The restaurant, upstairs offers a very nice panoramic view of the port ! 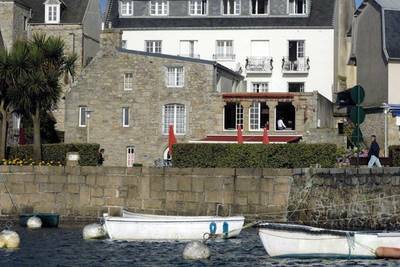 let yourself be guided for a tasting of local products, fish live from the Breton auctions, seafood platters, sausages with Roscoff onion from the farm of Combot...This charming hotel is decorated in a holiday spirit. Book one of our pretty rooms, sea view or view on the village of Roscoff; Sober and elegant, they offer you a stay in peace. Our large terrace, with a direct view of the port, is animated in summer by the boulistes. You can eat or have a drink in the shade of our red and white parasols. Live Roscoff ! and enjoy this privileged location on the old port.